There’s no doubt that the best air-fryers have huge health benefits for lovers of fried food! Cooking with a tiny amount of oil – or no oil at all – can bring life-changing benefits in calorie-reduction and improved health. So air-fryers are a dream come true if you enjoy the taste and texture of crispy, fried food, but need a healthier diet. In fact, the U.S. Academy of Nutrition & Dietetics has said that overall, air-fryers cut-out about 75% of the calories you consume with any other oil-frying methods! Air-fryers are perfect for cooking small amounts of fried food, but only a few have the capacity to fry large amounts for big families. However, XL or small air-fryers are very simple to use, so you can cook fresh or processed foods right away. And you don’t have to face the complicated calculations required with micro-wave ovens of different potentialities! Look out for fryer-baskets with a non-stick coating for easy cleaning in washing-up bowl, as those without it are harder to clean. However, many fryers have a fry-basket you can put in the dish-washer. Fortunately, the safety-features on air-fryers allow them to switch-off automatically, if you forget to remove the food when it’s been cooked (or over-cooked!). So compared to the dangers of cooking with a deep fat-fryer, including kitchen fires and serious burns from hot-oil splashes, this is a far safer product to have at home. Our Best Air Fryers reviews cover a broad range of the best air-fryers, designed to suit different consumers. So whether you’re a college student, or have a hungry hoarde of children to feed, these high-quality air-fryers each have excellent individual features that will suit your situation perfectly! This is the best quality, budget air-fryer. 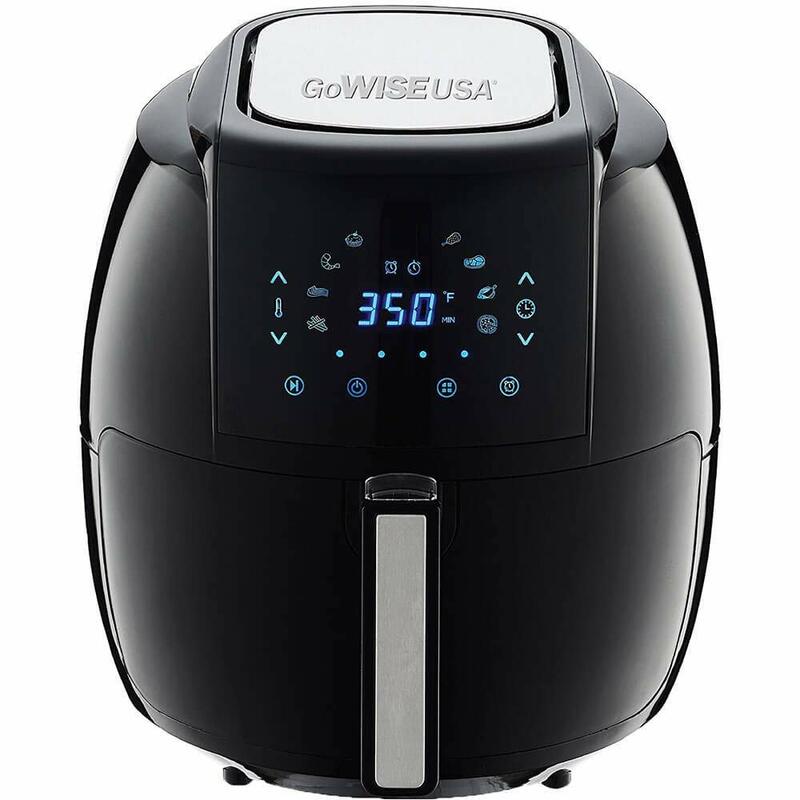 If you’d like crisp, tasty air-fried food at an affordable price, the GoWise Air Fryer is a useful kitchen accessory for busy cooks. And for a small kitchen, the GoWise is hardly larger than the top-rated machines, so it won’t take up too much of your work-surface. We all liked that this cooking device is much quieter in use than most other air-fryers on the market. You can’t pop it in the dish-washer, though, because it has a non-stick coated, fry-basket. However, it’s very easy to wash by hand after each use, and no hard scrubbing or soaking needed! In cooking tests, we found that the internal cooking surface doesn’t get uniformly hot. And so you need to turn and switch position of the food being cooked to get ‘even cooking’. However, with 7 auto-settings, for popular foods like French fries, fish, steak and chicken etc., you can really save time and cut a lot of calories from your diet! We recommend the GoWise for singles, couples and small families, who want to fry processed foods or side-dishes to go with a main meal. Available in 2.75 quart and 5.8 quart sizes. We voted this the best large capacity air-fryer. At the opposite end of the size range we have the Phillips XL for large families. It cooks very evenly and produces crispy food items, no matter where the food was inside the basket. The Phillips is a serious time-saver if you regularly fry main meals for your whole family. So you won’t mind that it takes up a lot of space on the work-surfaces, because the efficiency and convenience are very impressive! The controls are very easy to understand and the machine exterior stays cool and safe to the touch. So if you have young children or older people around, this is a very safe kitchen accessory. It does produce a lot of smoke, so adequate ventilation is important. And the best wire-baskets for even cooking, like this model has, are always the hardest to soak and scrub clean! This model has a 3.5 quarts capacity and recommended for frying for 4 people. Moving on to the best air-fryer for ease of cleaning, the compact Bella Air Convection fryer is another small unit. This air-fryer has a non-stick basket and can also be safely washed in a dish-washer. It’s very reasonably priced, but for even-cooking, you do need to shake-up the food you’re cooking, mid-way through. So it’s not a completely, ‘set and forget’ device like some brands. But giving the frying basket a shake is pretty simple cooking technique that anyone to do! However, this model performed the best in all of our cleaning tests! And that’s a very important feature for busy people, and college students. Therefore, we think this handy air-fryer would be perfect for college students, singles and couples who want healthier, simple cooking. And no tough scrubbing required when hand-washed or put in the dish-washer. We all know that kitchen appliances that are hard to clean just don’t get used, so this is a great choice for busy people of any age! This model has a capacity of 2.5 litres. If you’re a fan of fries, you’ll know they must be crispy, and we voted this model the best air-fryer for perfect, crispy fries! 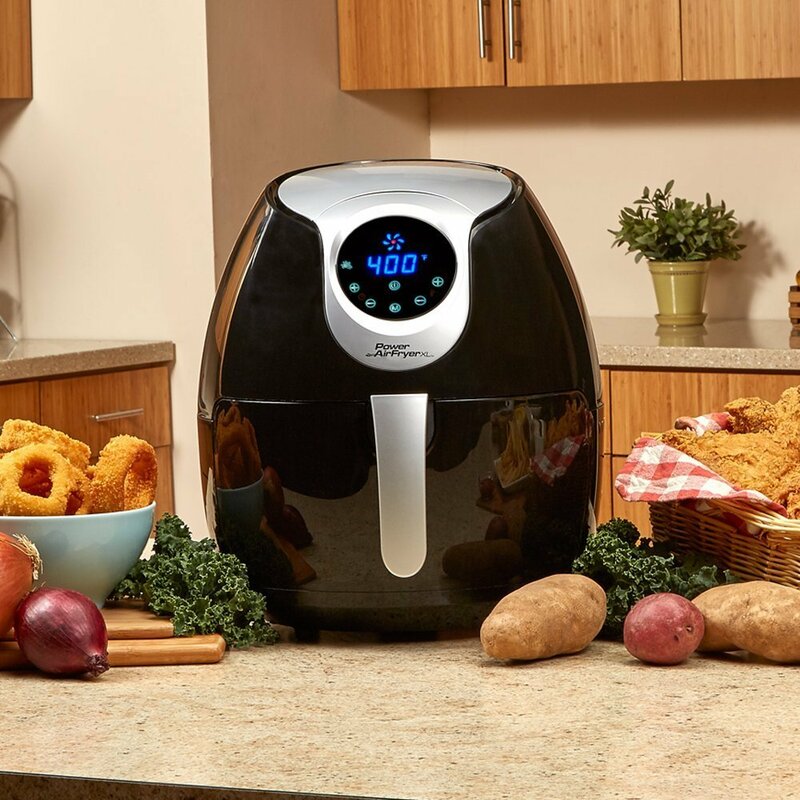 The Power AirFryer XL is designed for amateur and professional cooks who want to cook a variety of fried foods, without adding extra calories from oil. And it comes well-equipped with the largest set of accessories of all our best air-fryers. Keen cooks (and the not-so-keen, too!) will love the convenience of a pizza-pan, and there are two other pans in large and small sizes. Furthermore, as a useful safety tool, this product comes with Safety Tongs, which you really do need when removing fried food from any fryer. This large and efficient kitchen-aid also produced the best French fries in our tests, in batches large enough to feed 3 – 4 people at a time. But whilst the fries always came out crisp and evenly cooked, chicken-wings did have some under- and over-cooked areas. So its overall ‘even-cooking’ rating was spoiled a little by that. However, the capacity is a generous, 5.3 quarts with a handy divider, to cook different items in one session. This versatile AirFryer includes great accessories, as well as having a large capacity and cooking perfect, French fries every time! 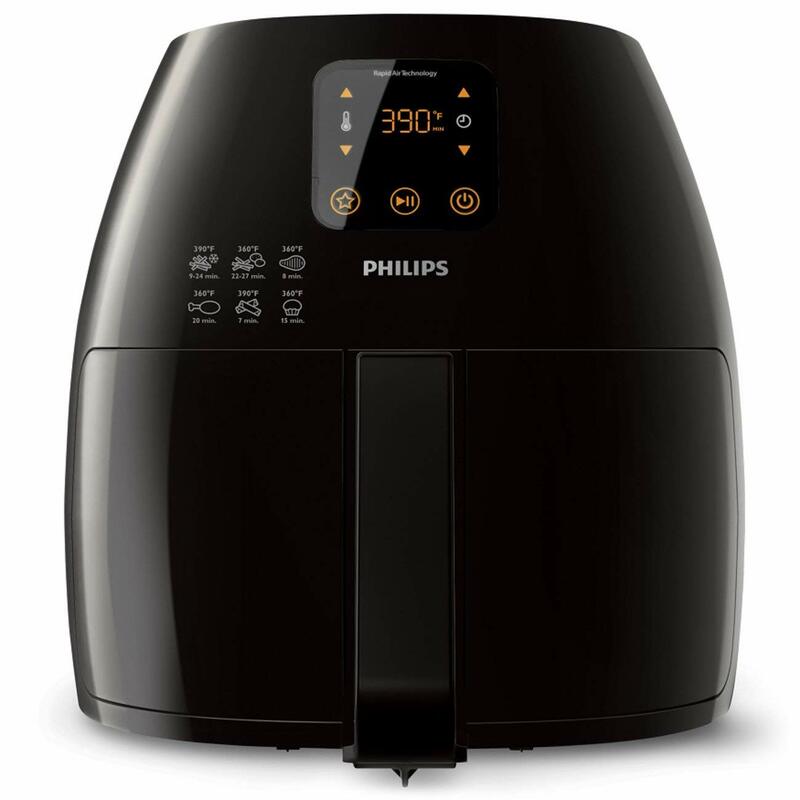 If you need a fryer that turns out totally consistent, crisp and tasty food every time – this is the best air-fryer of all! The NuWave Brio came out top in our testing process for several important reasons. First of all, it wins top marks for its ability to cook-through all foods evenly. 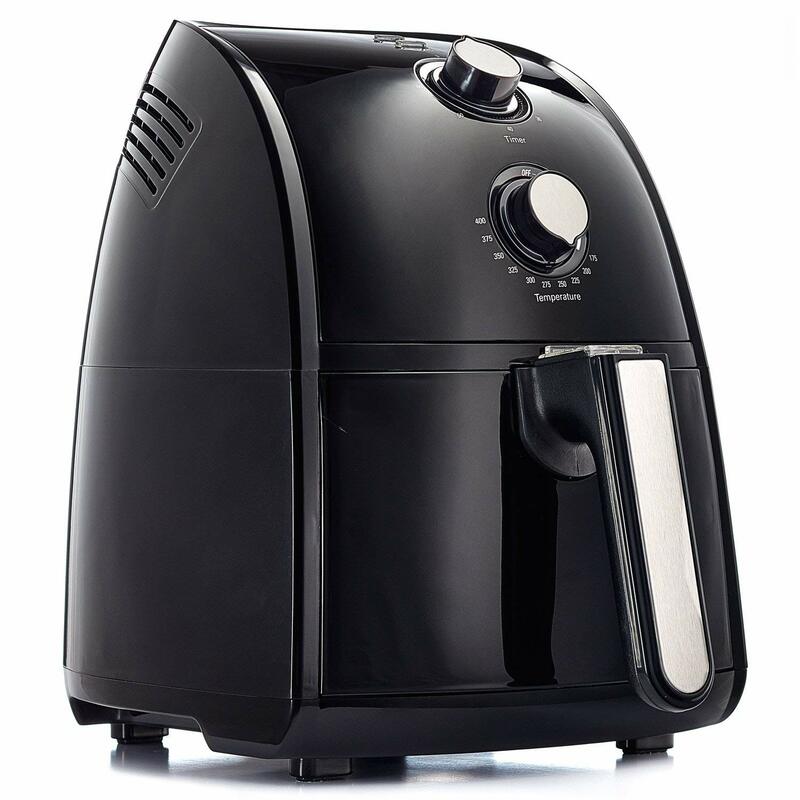 There were no problems of over-cooked and under-cooked spots with this top-quality air-fryer. 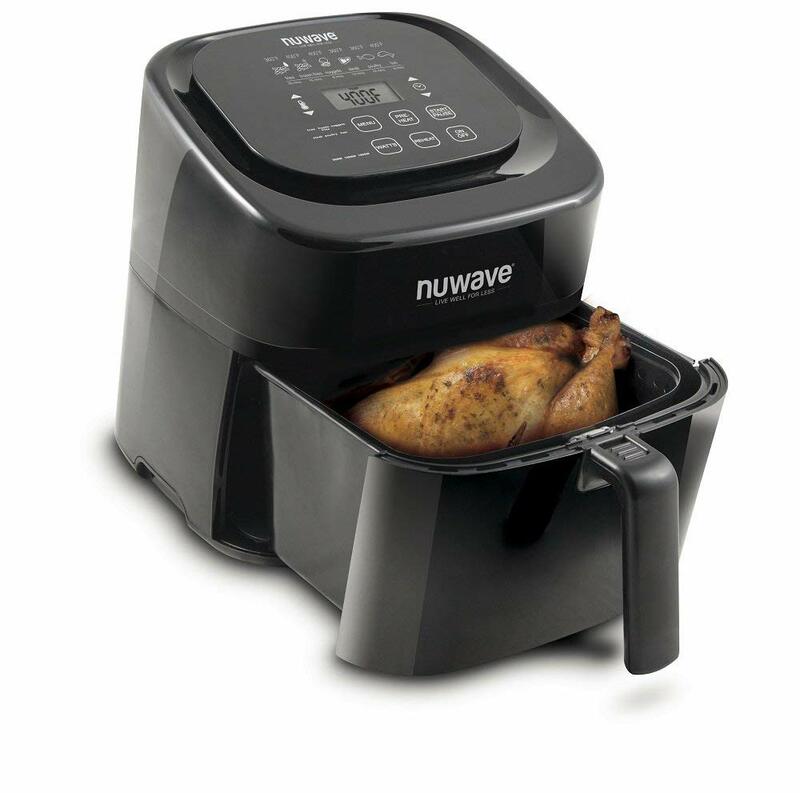 In addition, the NuWave also uses the least oil, as you just spray oil onto the cooking pan to stop food sticking. It’s designed for versatility, too, and users love the non-stick baking pan and baking rack included. These accessories allow you to roast, toast, grill, bake and broil even faster than you could in a traditional oven! The touchscreen control panel is far simpler than dial controls and the temperature range is impressively wide. For perfect cooking results, you can specify the temperature in 5-degree increments. This makes energy-saving, home baking a reality and is a huge advantage over most air-fryers that only have 10-degree increments. And finally, it’s a small unit for a compact kitchen, so doesn’t have a large batch cooking capacity. Multi-tasks – grilling, baking etc. 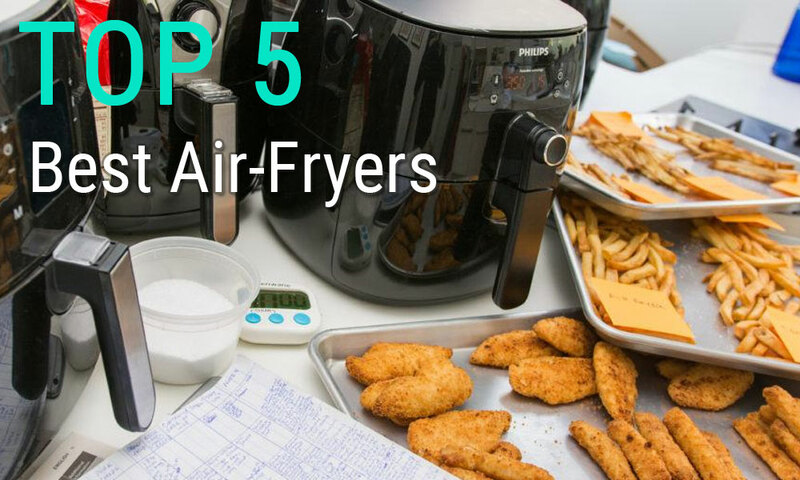 If you’ve not spoken with a regular air-fryer user yourself, here are their favorite ‘air-fry’ advantages compared to stove-ovens and micro-waves. Briefly put, air-fryers cook convenience foods quicker, cheaper and healthier than any other frying method. You can fry-up raw, or frozen vegetables, such as french fries and cook healthier meals, like tasty tempura vegetables and lip-smacking, stir-fry feasts. And for reluctant cooks, who find their microwave doesn’t produce very appetising food, we can assure you that ‘air-fried’ food always turns out crisp – and never soggy!